To conceive a great web site, organize it, design an appropriate layout and navigation is a hard enough task, but it is even more difficult to put it together so that it works exactly as planned. A web designer can't always be a web producer or developer. For that you need some serious code skills and an understanding of the technologies which lay beneath the page as seen in a browser. I use many modern shortcuts and software tools to rough out the pages of the web sites I produce. I'd be a fool not to. It means I can accelerate production and keep costs down. But because I have been building sites since 1992 – long before there were ANY software applications – I have a big advantage. I know what HTML code is doing, how to manipulate it in ways not implemented within the software tools. I can integrate new techniques and technologies to make your site do more. Clients who hire me for my concepts, creativity and design are often surprised at my coding ability. I produce not just basic static sites but complex and comprehensive database-driven sites with complete content management system (CMS) back ends. Not only do I design great sites I also build them. Whether you need a simple static web site or a large dynamic site with many features i can help. Contact me. 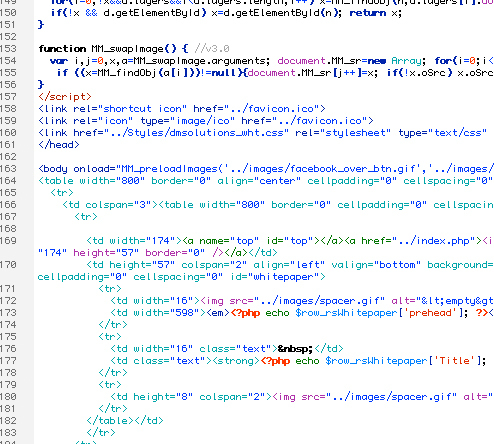 You might be a bit surprised at all the code and tags that actually make up a web page. Though I do use software like Dreamweaver to rough it out, knowing how the code really works allows me to streamline, tweak and otherwise manipulate the viewed page. I often go beyond the built-in boundaries of what the software allows and make pages do things they need to do. I also design and produce specialized email-based pages for promotions, invitations and news. These require a knowledge of different levels of HTML coding. 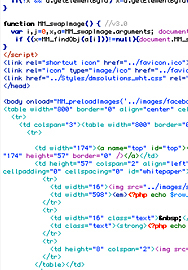 Behind every web page is a complicated set of scripts and languages.